Bando 97J4-U Poly-V Belt. Industrial Polyurethane. Home > Heavy Duty V Belts > Poly-V Ribbed (Micro -V) Belts > J, PJ Section Poly-V (Micro V) Belts - 3/32" Rib Width. > Bando 97J4-U Poly-V Belt. Polyurethane, fiberglass cord. 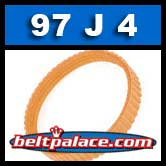 Bando 97J4-U Poly-V Belt. Polyurethane, fiberglass cord. Bando 97J4-U Poly-V Belt. Industrial Polyurethane, fiberglass cord. 9.7" Pitch length. 4 ribs wide (3/8").